Every once in a great while, a human being is born who greatly and positively influences the world in which we live. George Robley Howe was one of those people. Born in Norway, Maine in 1860, Howe accomplished some truly remarkable things in his 90 years of life. He was an early Naturalist, before it was chic. He prospected the Pleasant Mountain area of Bridgton, Maine until he tracked down the Amethyst source rumored to be there. He coined the phrase "watermelon tourmaline" to describe crystals that were pink on the inside and green on the outside. He identified the world's first "rose quartz crystals" (found at Mount Mica in the late 1800s). There are some historians who cite convincing evidence that George Howe founded the youth organization which later evolved into today's Boy Scouts... and Girl scouts, for that matter. But before Howe was so influential in the Maine Gemstone scene, he was many other things. We worked for an insurance company in Cleveland, Ohio. He was a reporter for The New York World and was involved in covering President Ulysses S. Grant's final days and the decision to make Manhattan the site of Grant's tomb. He was also a New York businessman for some time before meeting his future wife Emma Boardman of Hartford, Connecticut. On April 11, 1888, George Howe and Emma Boardman were married and moved back to Norway. In 1890, they had a daughter, Marjorie. 3 years later, Emma took Marjorie and moved back to Connecticut. In 1897, George and Emma divorced. This event devastated George and he experienced a turning point in his life. 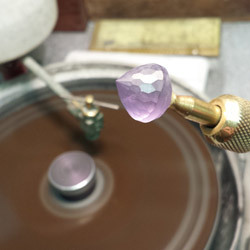 Abandoning his business life, he took a job on a farm in Denmark, Maine where he learned that beautiful, gem-grade Amethyst had been found on Pleasant Mountain, not far from where he currently lived. Howe decided that he would track down the locality of the Amethyst deposit. Some imply that searching for this lost Amethyst locality was Howe's healing time. The long hours and days he spent exploring the mountainside was time he did not have to morn the loss of his wife and daughter- or maybe he learned to accept their absence while cleansing his body and mind in the wilderness of Pleasant Mountain. This was a transitional time for him, from the man of business and the big city to the almost Thoreau-like lifestyle that followed his self imposed exile to the Denmark forest. When he returned, he was a different man. And he had found the Amethyst deposit. By 1898, Howe had moved back to Norway and was achieving the reputation of a man knowledgeable in the field of minerals and gems. Also at this time, he was presented with an opportunity: all over the country, youth groups were being organized and Howe seized upon this fad to form his own youth group with help from his long term friend, Oscar L. "Shavey" Noyes. Together, the two men led groups of enthusiastic youngsters on nature trips where they studied flora and fauna and of course, minerals. In 1850, a large and valuable pearl was found in a stream in New Jersey. The resulting "pearl rush" spread mostly west but also slowly north. Around 1900, Howe became very interested in the new hobby of "pearling" and discovered several brooks in Oxford County that contained pearl-producing mussels. His favorite river seemed to be the Crooked River which wound its way through Waterford, Norway and Oxford, eventually finding its way to Sebago Lake. He would sometimes take his youth groups on pearl searches and have contests to see who could find the first pearl of the day. Over time, he amassed quite an impressive collection of Maine Fresh-water pearls, some of which can be seen today at the Norway Historical Society Museum. 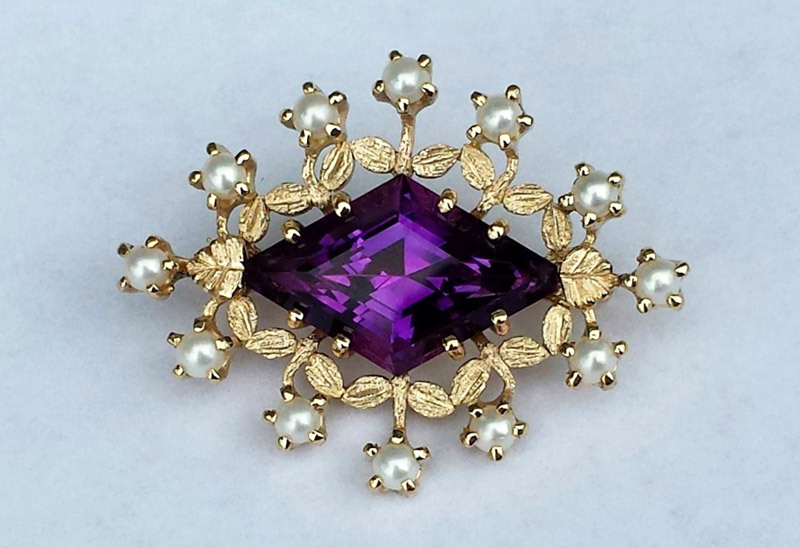 Pearls and Amethyst make such a beautiful combination- the contrast of sparkling, crisp purple and soft, glowing, creamy white somehow create a contrast that is much more than just the sum of the two. Howe must have felt this way also. 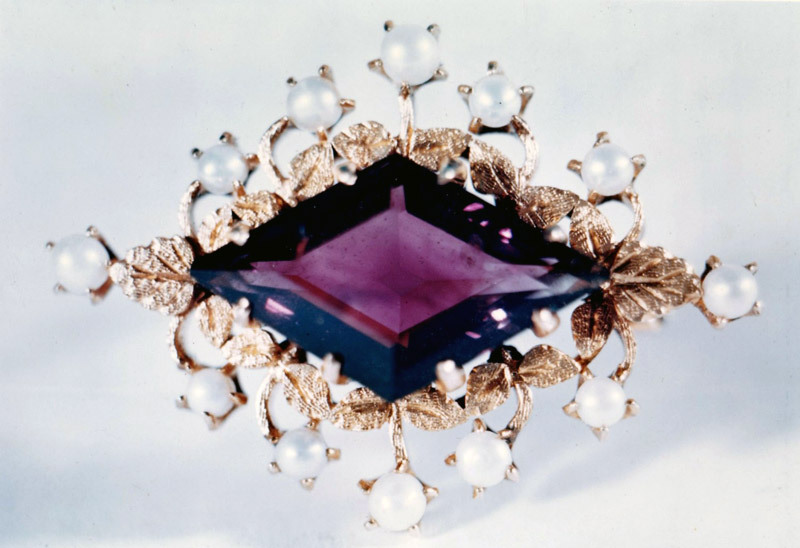 On his parents' 50th wedding anniversary, he presented his mother with his best Amethyst, cut by either William or Robert Bickford in their Norway gem cutting shop and set in a lovely Art Nouveau style brooch with 12 closely matching Maine pearls. The gold used to make the brooch was gold he had panned himself from the Swift River in Byron. And what an absolutely lovely thing his brooch was- a kite-shaped, deep purple Amethyst surrounded by tiny gold leaves, soft, white pearls positioned between them. Such an utter shame that it was lost in 1957. The loss of the Howe Brooch is one of the great tragedies of Maine gemstone history. When George Howe's mother, Mary died in 1913, the brooch returned to George who then gave it to his mother's best friend, Effie Akers. It eventually ended up in the possession of her daughter, Ruth. In 1957, while attending a school trip to Boston, Ruth wore the lovely brooch and while touring Faneuil Hall, noticed that somewhere, somehow, it had become unfastened and had dropped off. 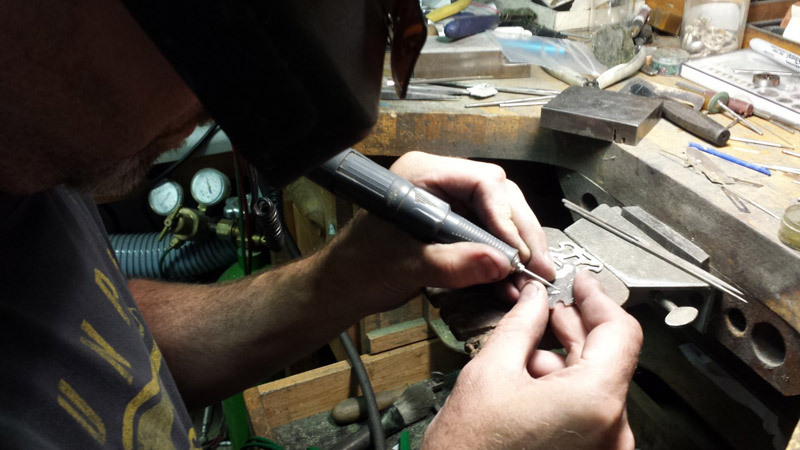 I first became aware of the Howe brooch around 1985 when I rekindled my past interest in lapidary arts and began researching the gemstones that came from Maine. It was Jane Perham's famous book "Maine Treasure Chest" which contained the only known image of the brooch, taken by the late Benjamin Shaub, a well known mineral collector and history preservationist. This brooch has fascinated me from the start. It is elegant and contains design elements from Art Nouveau movement (which is my favorite art style) but I think the contrast of colors and textures is what appeals to me most. 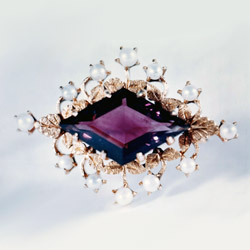 Crisp, clean warm violet, surrounded by warm glowing gold accented by soft creamy white pearls. It is an exquisite piece. I was saddened to learn from Vandall King, noted Maine mineral and mining author/historian (who contributed greatly to my historical knowledge of the brooch) that the piece was lost. What do you do when you discover that your favorite piece of Maine gemstone jewelry fell off someone's jacket onto the cobblestone streets of Boston 60 years ago and will likely never be seen again? You remake it, of course. Ben Shaub did not provide a size reference when he took the picture probably mid-century, shortly before it was lost. This presented Jane with a dilemma when she wrote her book. She and her mother, Hazel, speculated for hours as to the probable weight of the Amethyst. Eventually, they decided on a figure of 50 carats, surmising that Howe might have used one of his best and biggest stones and knowing that his secret locality had produced gems of this weight and caliber. Later evidence discovered by Van King in an early newspaper article proved that the weight was actually between 7 and 8 carats. 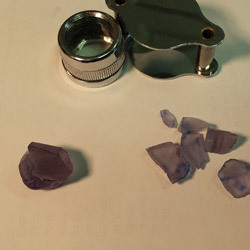 Stones of this size were readily available to me from my share of the Fourth of July pocket amethyst that my friends Jay Windover, Gary Howard and I had mined in 1993. 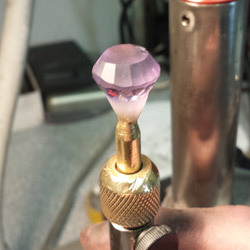 It took three tries to get satisfactory stone which weighed slightly over 8 carats. The original stone was too shallow to reflect light properly (evidence by the dead area or "window" seen though the table in Shaub's photo). Correctly cut, with the same dimensions, my stone was the proper weight for its size. In Shaub's photo, some design elements seem out of place. Some of the spacing between the pearls was uneven and the "stems" of the "flowers" that held the pearls were too long to be structurally safe to wear. Any amount of accidental bending would weaken the gold and eventually lead to the pearl element breaking off. Since I was correcting the cut of the Amethyst, I decided to "tweak" the pin's overall design as well. The "flower" elements were cast in 14k gold from one original model which I shortened slightly. 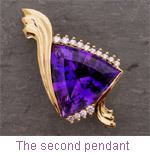 The setting for the amethyst was hand-constructed from 14k gold and the prongs soldered on afterward. 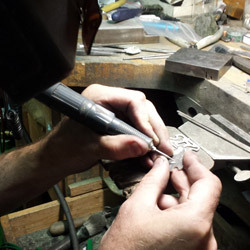 The "flower" elements were then individually fitted into place and welded. The end "flower" elements were reinforced from the back and then from the front using the two single larger leaves that were also hand carved from small gold sheets. I salvaged a period-appropriate pin finding from an estate piece and welded it to the back. And lastly, set 12 matched 3mm pearls. Although I tried to locate genuine Maine river pearls, this proved impossible and I was forced to use our pearl supplier. 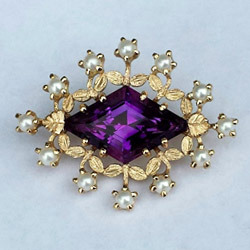 In the end, I found myself holding a replica of this wonderful brooch. It was very satisfying and I am confident that Mr. Howe and Mr. Bickford would have appreciated my efforts and their result. I can't help but wonder if the original is still out there somewhere. Maybe someone found it and kept it all these years. It may be part of someone's jewelry collection, worn and enjoyed or part of an estate, resting in the darkness of a safe. Wouldn't it be wonderful to find it? Just to learn of its survival, to know that this beautiful part of our local history survived and is still cherished. There is always a chance. Click any photo to enlarge. Mobile users: Swipe left/right to browse, swipe down to exit. 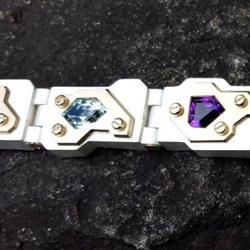 One of the most complex and wonderful pieces I have ever created is this Steampunk style bracelet composed of Sterling silver, 10 karat gold and custom cut Maine Tourmaline, Maine Amethyst and Maine Aquamarine. 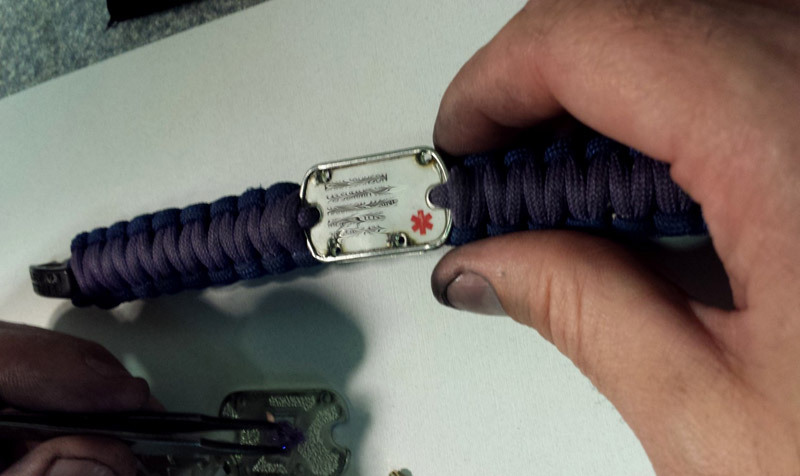 Our customer came to us with a request for a custom bracelet to match several other custom piece we had made for him. 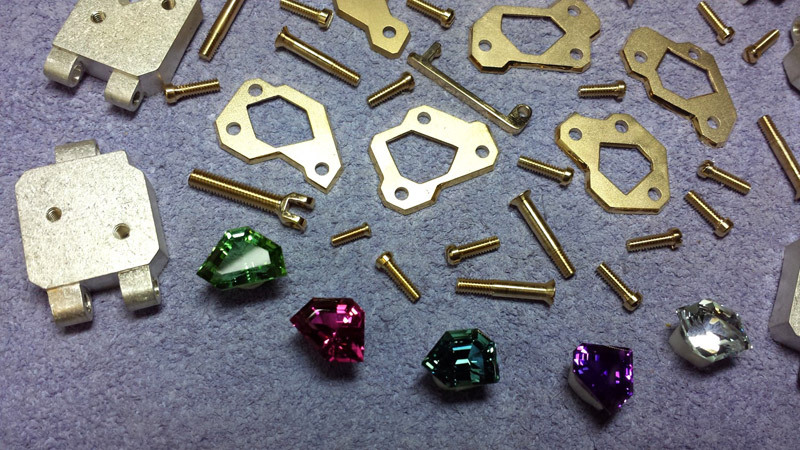 Initially, I had planned to make a drive-chain based bracelet from multicolored gold and gemstones but the design just wouldn't come together. After much sketching, I came up with a design using seven sterling links and five gemstones. Keeping in style with the previous pieces, the gemstones were to be held in place with plates that were in turn held with functional screws. 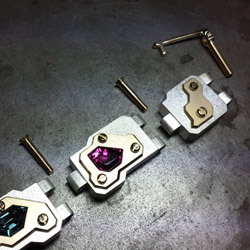 I first faceted the five gemstones: a blue tourmaline from Mount Mica here in Paris, a green tourmaline from the Dunton Quarry in Newry, a pink tourmaline, also from the Dunton Quarry, an amethyst from the Intergalactic Pit in Stow and an aquamarine from the Aldrich Prospect in Stoneham. The finished handful of gems was beautiful to behold (and hold). 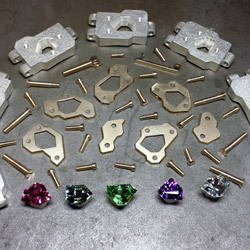 Next, I carved seven distinct yet interchangeable links from wax, hand-milled the seats for the stones and cast them all using Sterling silver flatware as casting metal. I cut the plates next from recycled 10 karat gold that I melted into ingots and rolled into the proper thickness. I really wanted to make this piece completely dissassembleable, which meant I needed to make three types and sizes of gold screws. 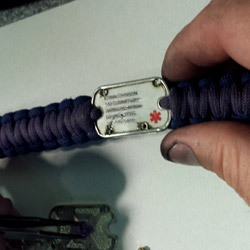 The clasp would contain two of these. I had to find and purchase a miniature tap and die set and had new respect for my machinist friends by the time I was done making the small pile of screws. 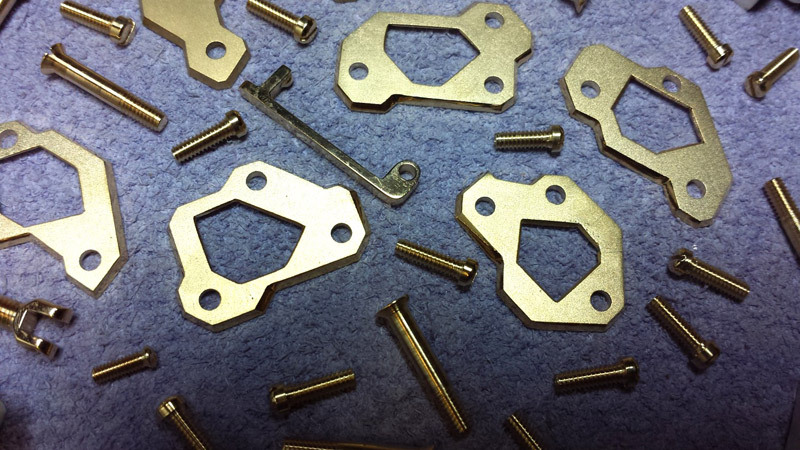 At the end, I could make a screw from a cast gold rod in a little over 15 minutes. 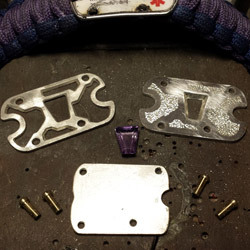 I gave the sterling links an industrial rough tumble surface in our magnetic finisher and the plates a satin finish with a glass-bead blaster. The edges of the plates and the screw heads got a high polish finish for accent contrast and I was ready to assemble it all with a miniature screwdriver. It went together perfectly and our customer loved it. It is one of my very favorite and most memorable custom pieces. 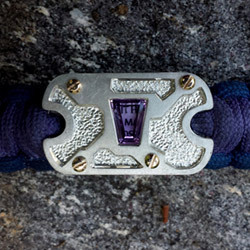 This is one of the most sentimental and interesting pieces of jewelry we have ever made. 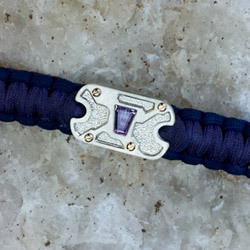 The challenge was to turn a medical bracelet into an heirloom quality bracelet that could be worn by a son to honor and remember his father. We discussed several options with the mother who came to us with the project. 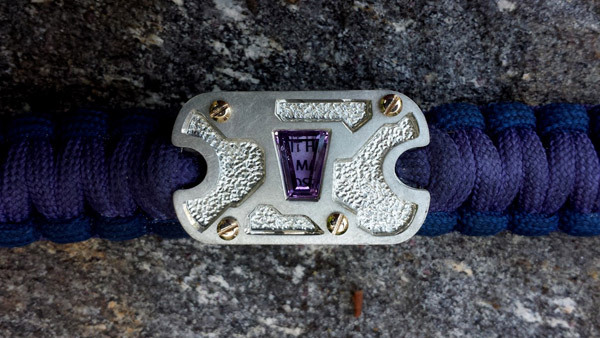 In the end, she chose the full-out, nothing held back option: a steam punk style design in silver, gold and Maine Amethyst, with fully functional, hand milled screws. 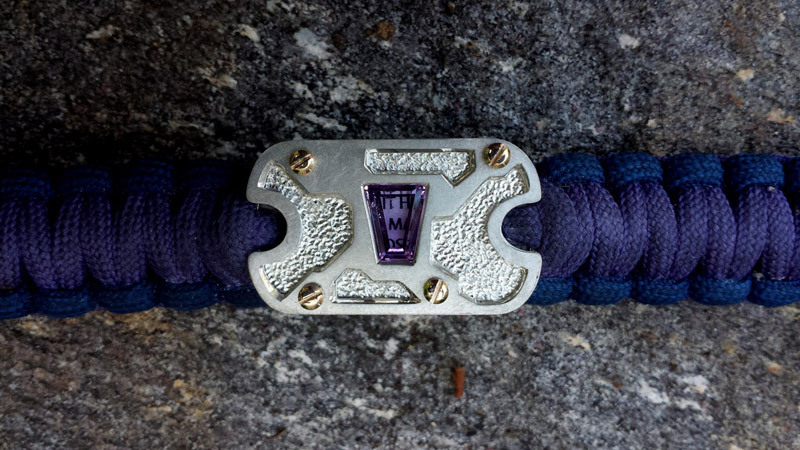 Intricate and fascinating, beautiful and masculine, completely handcrafted and totally unique.The result was one of our favorite and most satisfying custom pieces. 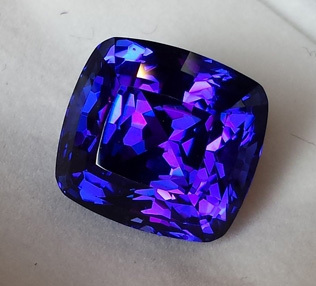 This tanzanite was sent to us by a customer in California to be used in a custom man's ring. 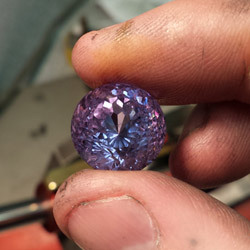 It weighed 24 carats and its color was astounding but unfortunately it was so poorly cut that it couldn't be set. We recommended to our customer that the stone be entirely refaceted and he agreed. The end result was this beauty. Although slightly smaller at 16.78ct (our estimate was between 14.4ct and 16.8ct) the stone is now proportional, incredibly brilliant and settable. 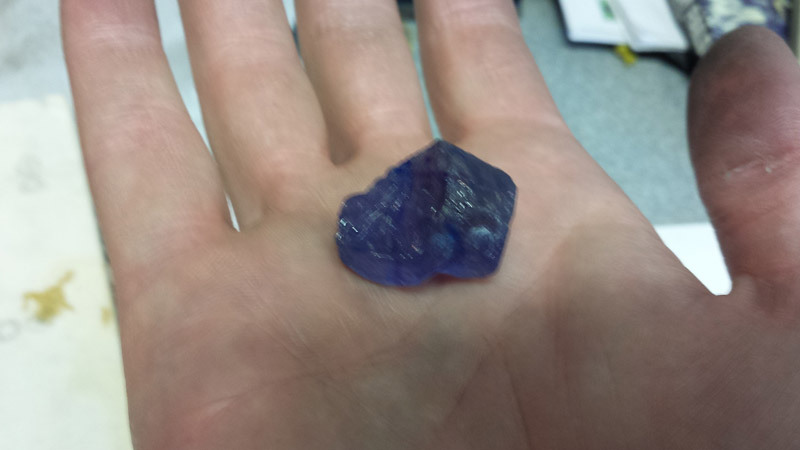 Additionally, the awesome color of this gemstone is now much more prominent. The next step will be designing a setting for it. 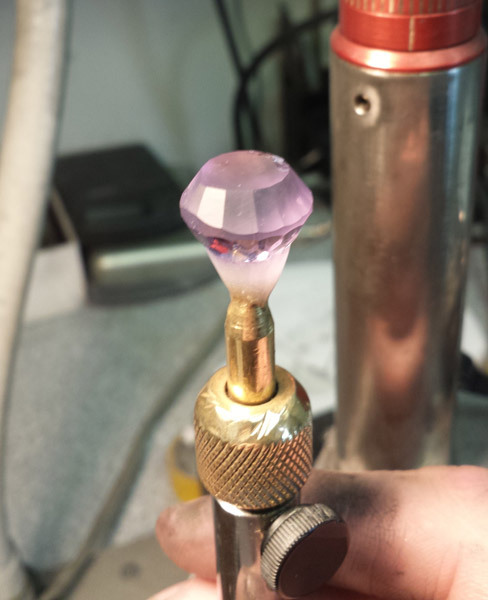 If you have a poorly cut stone, having it recut usually makes it brighter, more aesthetic and more valuable. This is a service that we offer. Visit our Services page for more information. Click any photo to enlarge. Mobile users: Swipe left/right to browse, tap to show/hide captions, swipe down to exit. 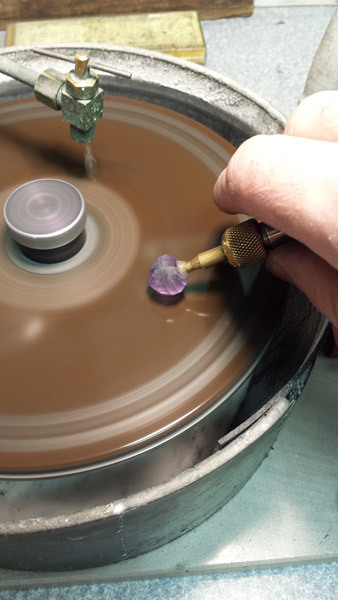 Just before Christmas of 2014 we were given the opportunity to cut a gemstone by a well known East coast mineral collector. 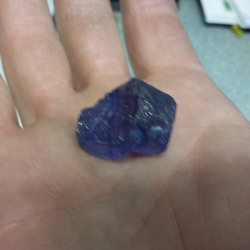 The stone was a purple apatite from the Pulsifer Quarry in Auburn, Maine. It was purchased from the estate of an undisclosed jeweler by our client. Purple apatite is a rare mineral to begin with occurring mostly in Maine, Afghanistan, Brazil and some other minor localities. 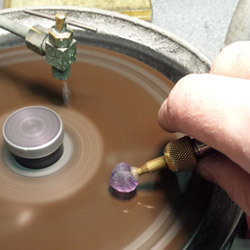 Very seldomly does it occur in gemstone quality. 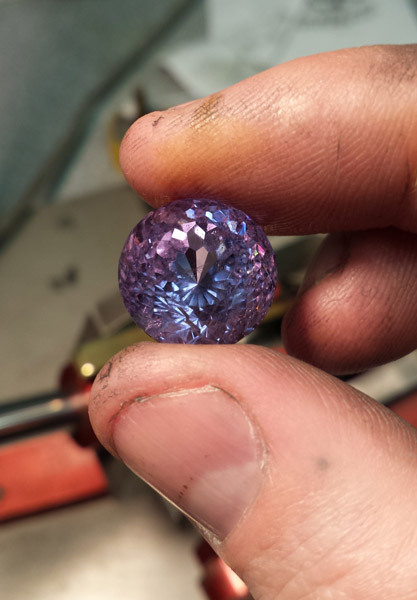 The previous record for Maine is 7.36 carats. 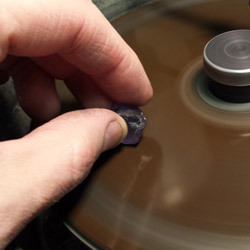 Faceting apatite is somewhat of a challenge , the material is soft and heat sensitive. 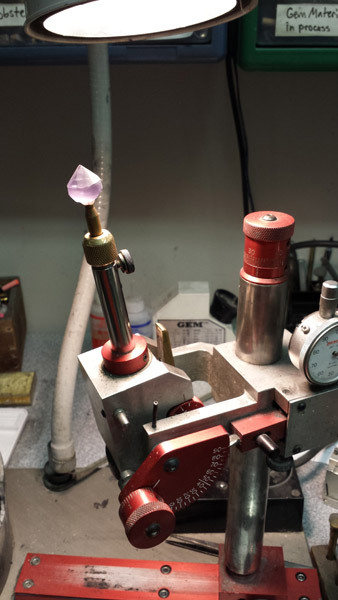 After some study and research we began the process of turning a rough crystal section into a finished gem. The end result after 9.5 hours was a gemstone weighing 21.53 carats, shattering the Maine record, establishing a new North American record and second in the world only to a 55 carat Brazilian stone. This was a fun and challenging project, made even better by the idea that this stone came from our own state. The idea behind this project was inspired by a recent discovery of a forgotten necklace by a mineral enthusiast. While many people have heard of the famous Hamlin Necklace, commissioned by Augustus Hamlin in the late 1800's, composed of Maine tourmalines and currently owned by Harvard University, very few people are aware that this was not the only necklace he had made. In fact, the Hamlin necklace was one of two known necklaces. The second, newly discovered necklace was part of a suite named "the Parure of American Gems". Evidence of this previously unknown necklace was found only in one place, a Harper's Bazzar magazine from 1869. As a jewelry designer and local history enthusiast (particularly as it relates to native gemstones and the people behind them), I found it both fascinating and disturbing that such an important piece of jewelry could be so completely lost. It got me interested in researching and preserving the story behind the "Parure" and other historically significant pieces of Maine gemstone jewelry. As a result, two things happened. First, I began reading all known literature regarding the subject of Maine gemstone jewelry with the idea of eventually writing a book. As I amassed piles of photocopies and notes, I discovered several references to other unknown pieces and actually found a new pendant at the Boston Museum of Fine Art. 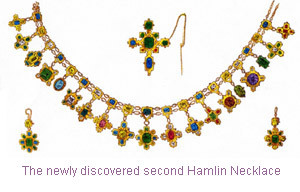 The two pieces that I found most fascinating were both of Hamlin's necklaces, not because of the design (the Parure is a wonderful piece, the Hamlin Necklace focuses more on the gemstones than the metalwork), but because of the idea that Hamlin used multiple pendants as components to create a "Master" necklace as impressive as any royal "crown jewels" of the era. 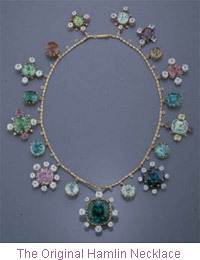 Hamlin also seemed to use both necklaces as showcases for American gemstones (although in its current configuration, the Hamlin Necklace consists of Maine tourmalines). It also seems that in the case of the Hamlin Necklace, he used it as a sales device for the individual pendants. There is also evidence that at least the original Hamlin Necklace was accompanied by dozens of additional, interchangeable pendants of different gemstone colors from many other localities, some not even American, enabling the wearer to colorcoordinate with clothing or occasions. The idea of being able to wear one pendant, some pendants or all pendants depending on the situation is something that I find very intriguing and was the inspiration for the second thing that happened. I had a brainstorm one night- to design and create a "Hamlin-style" necklace with Maine gemstones and in an Art Nouveau style. 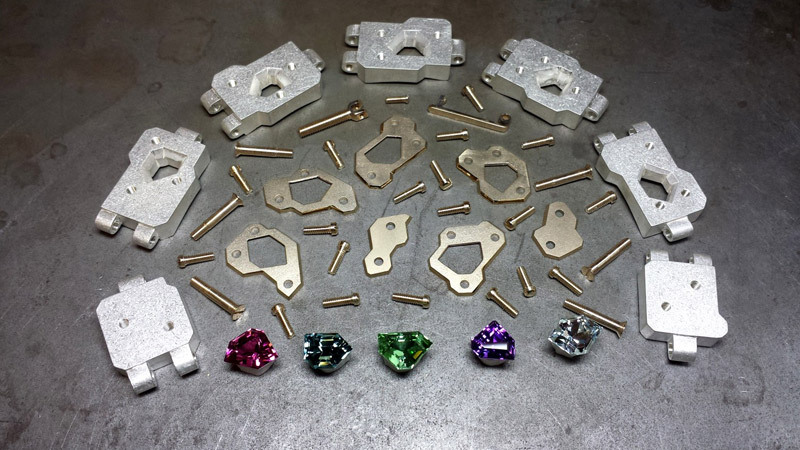 I would design a master necklace with multiple attachment points. 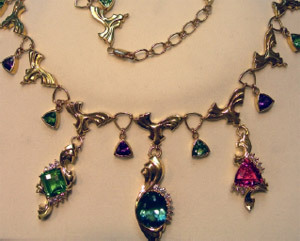 Like the Parure, my master necklace would include multi-color gemstones and could be worn by itself. 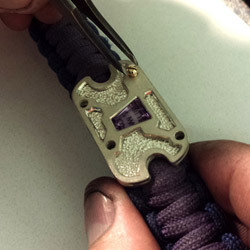 All the pendants would be detachable and be able to be worn on a separate chain if desired or as a single pendant hanging from the master necklace. Each pendant would be in a similar style and there would be no mistaking the idea that they were all part of a "family ". They would all feature Maine gemstones but would be accented by diamonds instead of the colorless beryls that Hamlin often used. Finally, the pendants would be commissioned and owned by as many different people as possible. Once all the pendants were completed, the owners and their pendants would be invited to an assembly event where I would put the entire thing together and everyone would get a chance to wear it as a whole, take pictures and participate in what I hope will be an historic event as the necklace will only be together as a complete piece once. I began discussing this idea with customers that seemed like they might be interested in participating and sold the idea to two; a couple from Waterford and a man from Paris (Maine). The Waterford couple was the first. I showed them a stunning 12+ carat blue oval tourmaline that I had recently cut for Gary Freeman, owner and operator of the famous Mount Mica tourmaline mine. Gary had kindly (and shrewdly) allowed me to cut several of his better pieces of newly found gem rough and market them through my store. They fell in love with it (as we all did) and bought it loose immediately. 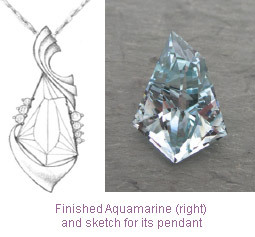 I had an inspiration while waiting in line at the Hannaford Deli and began sketching designs for the pendant that night. I finally came up with a blueprint that would lend itself to my master plan. They loved it and I began to create it. I carved wax for a couple of days and then cast it in 18k yellow gold. 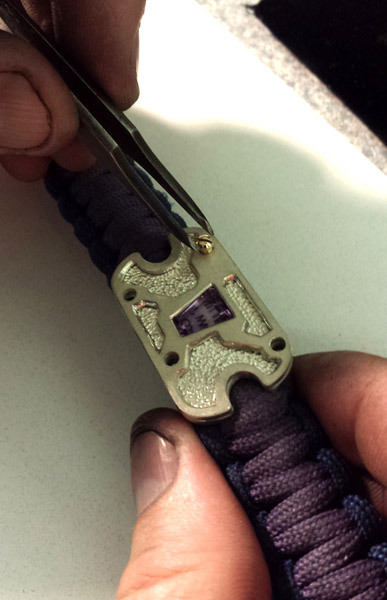 It had 8 diamond accents ranging from 3mm to 1mm and turned out as beautiful as we could have hoped. My customers were very pleased and began talking about the master chain. I had some vague ideas and began refining my doodles into something more concrete, deciding eventually upon a triangular link with Art Nouveau styling which matched the motif of the pendant. There were 13 links, each connected by a triangular jump ring. 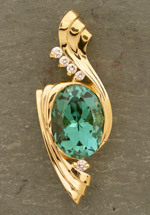 A bezel set triangular gemstone hung from every jump ringalternating green tourmaline and amethyst. I carved a master link from wax and cast it in sterling to create a master model, from which any number of links could be made using a rubber mold and subsequent wax copies. 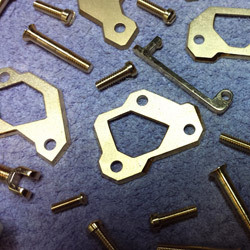 The jump rings all needed to be made by hand. I wound 18 gauge 18k yellow gold wire around a ring mandrel and cut large circular jump rings. Then I cut three equal sized curved sections of the larger jump rings and soldered them together in a triangle. 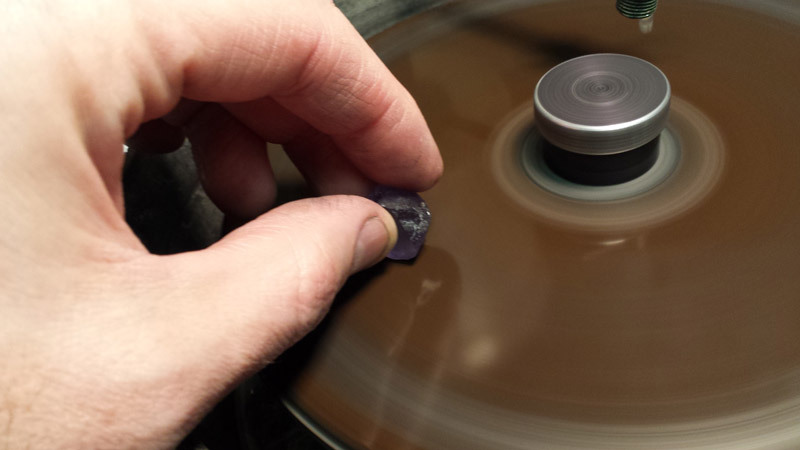 Next, I selected an appropriately sized trillion gemstone (7mm) and carved a bezel setting for it. After casting it (again in sterling) and refining it's shape and fine tuning it's size, I soldered a small round jump ring to one tip and molded it in rubber. I could now make multiple master necklaces. In the meantime, I sold my idea to the man from Paris who wanted to surprise his wife with something completely spectacular. I showed him several large gemstones, including a 27+carat trillion-shaped Fourth of July Amethyst I had cut a few years earlier. He loved the stone and thought it perfect. I sketched a few vague ideas, resketched, refined and finally came up with a suitably spectacular design which he loved. I ended up casting his pendant very shortly after the first pendant. 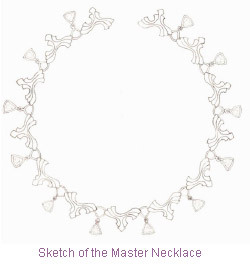 When it was finished and set with the Amethyst and accent diamonds we began discussing the creation of the master necklace that it would hang from even as I was discussing the very same project with my first clients. I ended up creating them both virtually at the same time. One was finished a couple of weeks after the other, but I don't remember which. 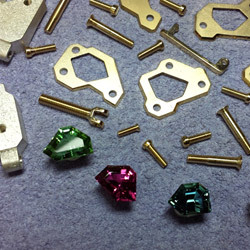 One major issue was coming up with all the 6mm trillion amethysts and tourmalines that were set in the master necklaces. They needed to be very similar in color and cut and I didn't have enough of them in my current inventory. 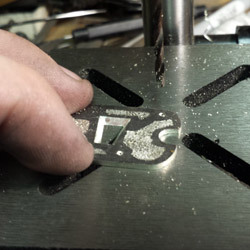 My assistant and I spent a week or so cutting 6mm trillions. 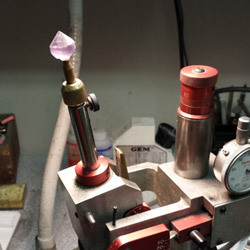 Since I wanted to be able to detach the pendants at will, I used a large, slightly modified spring ring as an attachment device on the blue oval pendant but decided that the amethyst pendant might be too heavy for such a thing. 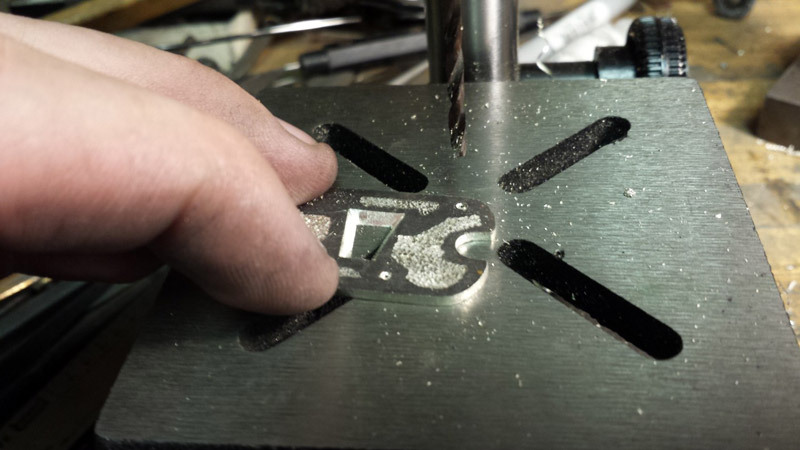 For that, I just used a heavy jump ring and didn't solder it shut. When assembled, the two necklaces were truly beautiful and exceeded every expectation of both clients. 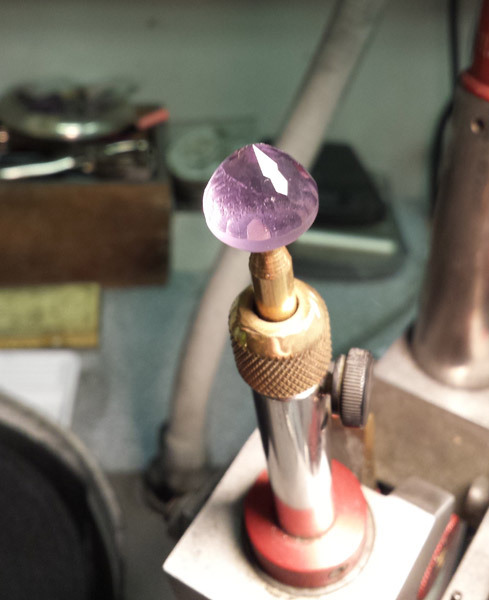 I felt at this time, that my own wife was being left out of this important picture and so began playing with some ideas for her upcoming birthday present using a stunning square Fourth of July amethyst gemstone that I had saved since 1993. 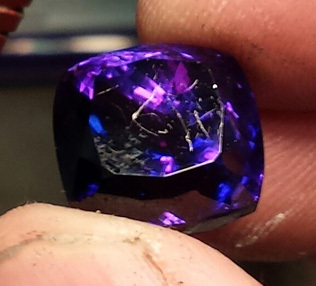 This stone weighed in the 8carat range, had a checkerboard table and was one of the deepest colored stones that I had ever cut from the tons of amethyst that my partners and I had mined from our Deer Hill mine. I was saving it for something ultra special and this was it. 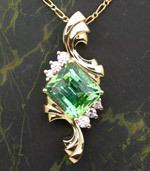 Using the same Art Nouveau styling, I created another pendant also in 18k yellow gold and accented with diamonds. It turned out as lovely as the other two and Julie loved it. 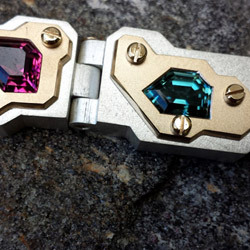 Sometime after this, I approached Gary Freeman about creating several pieces of jewelry using some of his other top end Mount Mica tourmalines. He agreed to my plan and showed me a piece of gem rough which he had mined the previous summer. This piece of tourmaline was a deep, saturated mint green, very reminiscent of the best Newry material. 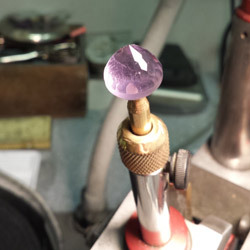 The stone I cut from this stone was an oval of 4.76 carats. Gary had given me complete control over the design so I sketched with that in mind. 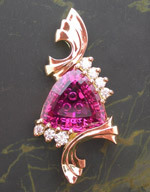 The pendant that I eventually created reflected a definite advance of the necklace's motifs. 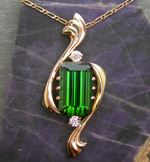 Gary was pleased with the pendant and commissioned one more, using a 14.97 carat emerald cut green Mount Mica tourmaline that I had used in a value survey I had conducted that year at the Tucson Gem Show. The general reaction to the stone among the veteran gem dealers I showed it to was very positive, most dealers thought it to be a pleasing shade of green and lively. I decided to use it rather than any of the other ones because there seemed to be an intensity to the green that was striking. 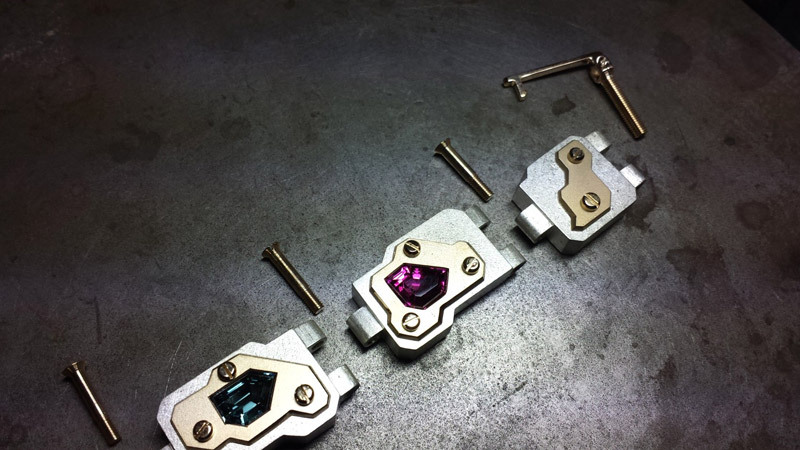 When the pendant was designed and created, I set the tourmaline and was surprised to see that this quality of the stone was augmented by the setting. The finished pendant was stunning. 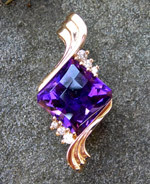 The next pendant was commissioned by the first couple. 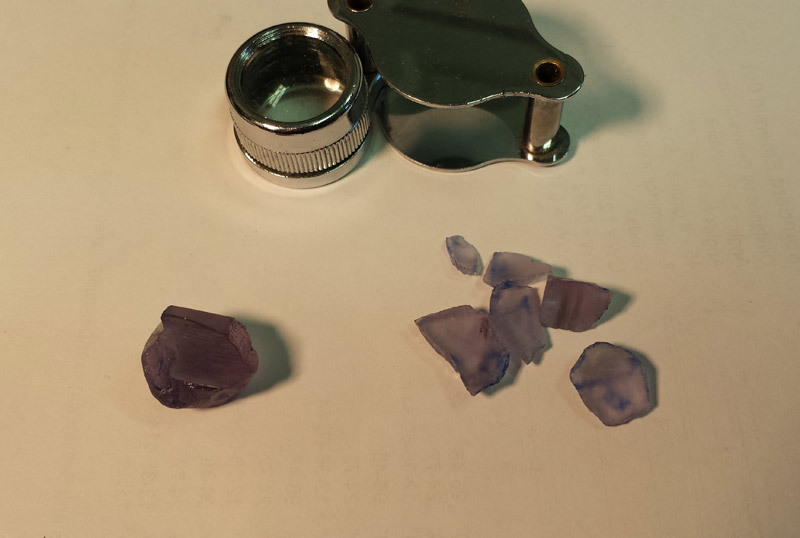 I custom-cut four more stones at their request, each to be used in an additional pendant. All four pieces of rough (two pink, two green) were part of the Calef Collection that I had purchased several years earlier. Glen Calef was Plumbago Mining Corp.'s first gem cutter. This tourmaline was part of Mr. Calef's payment for gemcutting services during Plumbago's initial start up. 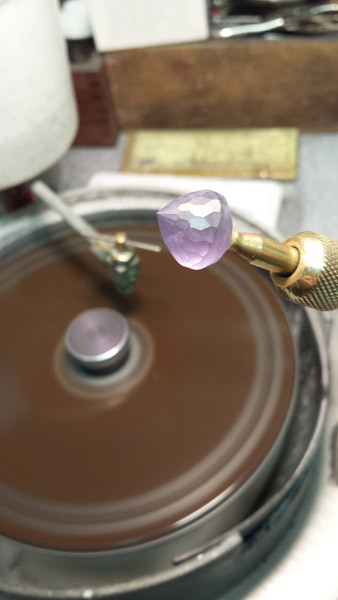 The first gemstone we selected was a pink trillion with three optical bubbles cut into a modified three-facet culet. I used a design inspired by another design I had done for Dale Sweatt, one of the initial discoverers of the Newry tourmaline bonanza that the four stones had been part of. The finished piece was again another step forward in the progression of the necklace's motif with it's improved proportion and addition of the gemstone's optic bubbles. The Waterford couple commissioned one more pendant in the fall of 2010 and I designed it using one of the remaining Newry stones- a rectangular, mintgreen stone with a checkerboard table. 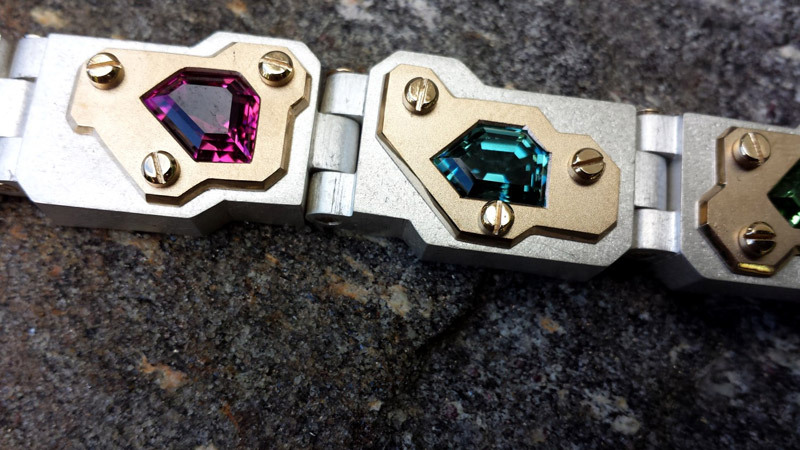 I used the same style as the pink trillion, with some minor alterations to accommodate the emerald-cut shape and produced a pendant which balanced it on the other side of the original Mt. Mica blue oval. 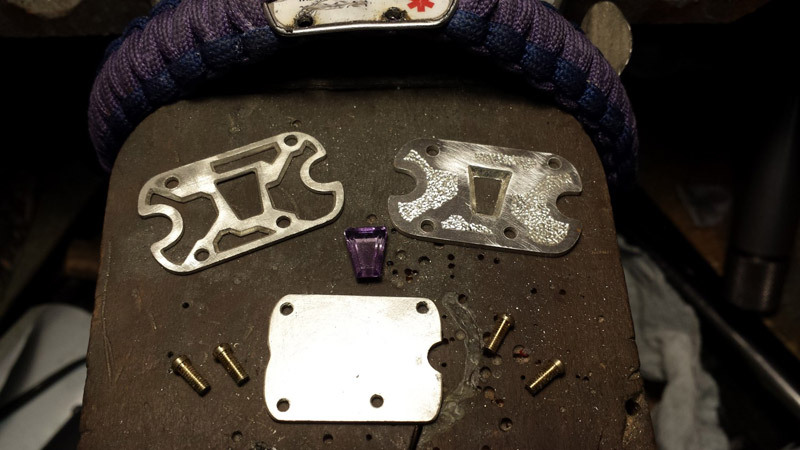 Currently, we have plans for the last two pendants in their necklace to be completed relatively soon. 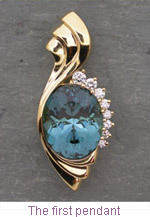 The Man from Paris has plans for two additional pendants and a woman from Poland (Maine) who is a figure in the local gem-mining scene has commissioned one made from a large, recently found aquamarine. I recently completed cutting it in a total free-form style, unlike anything I have ever done and have finished sketching a design for the goldwork. Work on this piece will commence soon. The end of this project is in sight although like the original Hamlin Necklace, I suspect there may be many more pendants designed for it. The original collection might be the most well known, but as time has passed I see the artwork progressing and becoming more creative. It may come to pass that this project inspires further projects, all related and interchangeable but with new directions and motifs. The possibilities are incredibly exciting.